Good pictures. Lots of Animals for you guys. I’m a student at UC Berkeley’s graduate school of journalism and I’m hoping to speak with you about your time at the Pt. Reyes Light. I’d like to contact you via email to give you some details about my project. I can be reached at cobyroscoe11@gmail or 510-414-8435. I hope this note finds you well. It was a pleasure conversing with you regarding the natural splendors and wonders of the Point Reyes Peninsula and legendary West Marin County. At the risk of seeming to exaggerate, aside from the slopes of Mount Rainier, another grand Muir stomping ground, my explorations on the peninsula at times could be described as transcendent or spiritual, walking alongside the elk herds and under rare dark starry skies. I am the no doubt somewhat disheveled-looking kayaker-camper-explorer fellow who briefly shared your picnic bench at Toby’s Coffee Bar at closing one fine summer afternoon in late July. 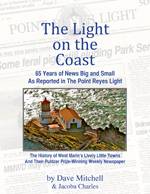 I managed to misplace the copy of the Point Reyes Light bearing your contact information and have just this evening found your blog …. as well as your captivating Wikipedia biography (from exotic Iowa to intrepid exposes and the Pulitzer Prize, I feel honored to have had the opportunity to chat). As promised, if you remain interested, I would happily share selected images of your magnificent landscapes, Tamales Bay, Drake Estuary and wildlife on e-film. A few may be worthy. Share your email again and I will attach a few samples. Jim McDermott – Geologist and would be intrepid explorer. Sparsely Sage and Timely is powered by	WordPress 4.9.10 and delivered to you in 0.562 seconds using 56 queries.